Helping your child get fit & healthy! Each class includes a warm up, cardio, strengthening and stretching. Our classes are designed for weight loss and keep your child moving and burning calories for 60 minutes. If you are tired of programs not working towards helping your child lose weight…Fear no more, you have found the right program. All movements and exercises are designed for growing bodies and are beneficial to your child’s development. The classes are fun, high energy…but unlike dance or karate, we keep them constantly moving and burning the calories needed for weight loss. Each class is divided by age and each age has a specific time slot. Click on one of the tabs below, on the appropriate age group, to see your child’s class times and additional information. 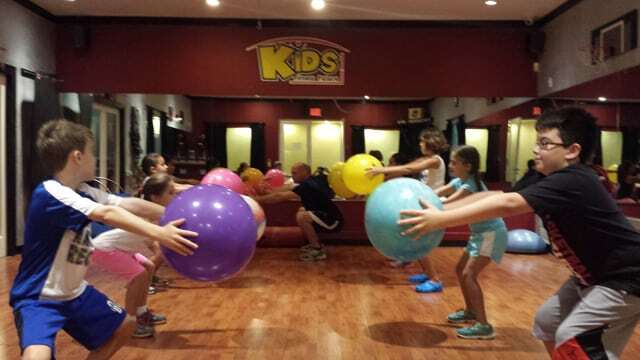 This FUN fitness class is developed for kids between 8 and 11 years old. The class focuses on weight loss, exercise movements, nutrition, and high-energy fun. 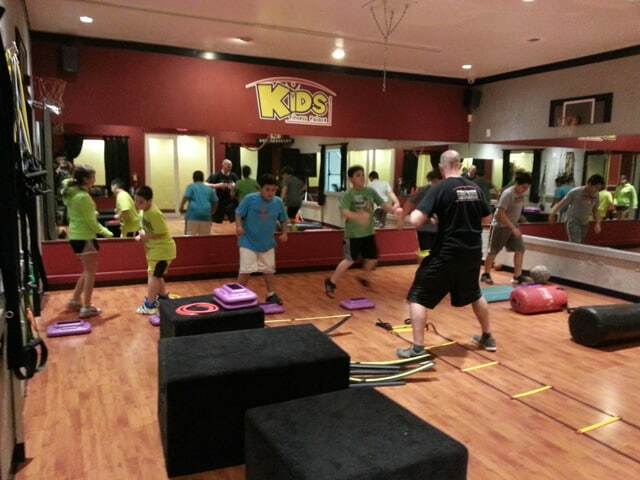 Our 6pm class is more structured and gives your child a more balanced life long approach about exercising. Not only will the learn how to perform basic exercise movements correctly, they will also learn about nutrition and how choices affect their weight. Because we deal with kids who may be getting teased or bullied at school, frustrated because the may not be able to fit in clothes like their peers, or just feel the pressure of being a little heavy – we take a conservative approach to both the type of exercise they do and the message we send about eating. We keep the classes FUN, yet effective and they WILL leave sweaty and smiling. We have programs in place that will help your child with nutrition and guide them into making better choices, which will stay with them for life. Due to website and program plagiarism, we keep class descriptions to a minimum. However, simply enroll your child today to try one of our classes to see what the programs have to offer your child. Sign up below and schedule a complementary session for your child. Give them the gift of health today! Don’t forget to visit our photo gallery, @kidsfitnesspalace and like us on Facebook. While sticking to an intense workout, kids will find that the challenge is entertaining and before you know it, time is up and they just finished an amazing workout. They will sweat, laugh, and strengthen their muscles and their minds at KFP. Choose a class, based on the age of your child, from the schedule below. Call 305-270-7333 to reserve a spot for your child in that class. Please show up to your reservation 5 minutes early to give yourself time to fill out paperwork and get your child acclimated with our facility. Make sure they come prepared for a workout: sneakers, workout clothes, and water. Located at 8861 SW 132 Street, Miami Fl 33176. Opposite (North) of PF Chang’s at the Falls Shopping Center. Directly behind the Florida Blue building. Check out our photo gallery to see examples of the class or watch our demo video for the classes. Don’t deny your child the opportunity to have a blast working out. Space is limited and varies by age group so call us at (305) 270-7333 to reserve your child a spot in one of our revolutionary kids classes. They’ll be glad you gave them the gift of health!